Xi'an (西安) is located at 33 north and 107 east, in the southern part of GuanZhong Plain in Shanxi (陝西) province with Qinling Mountains (秦嶺) to the north and the Weihe River (渭河) to the south. with an elevation of 500 metres, the Weihe Plain extends between Baoji in the west and Tongguan in the east and borders the Qinling Mountains in the south and the Huangtu Plateau in the north. Lying in the warm zone, the plain has a temperate climate with four distinct seasons. Chequered with the Weihe, Jinghe, Luohe, and Bahe rivers as well as the Jinghui, Weihui and Luohui canals, the fertile land on the plain has easy access to irrigation facilities and an abundant yield of farm produce. Xi'an lies in the centre to the south of this plain, a favourable geographical location surrounded by water and hills. Xi'an called Chang'an (長安) in ancient times, more than 1 million years of condensation of history. During Xi'an's 3,100 years of development, 13 dynasties such as Zhou (周), Qin (秦), Han (漢) and Tang (唐), held it as their capitals. Temperate and continental climate; cold and dry in winter and hot in summer and rainy season comes in July, August and September, average temperature in 13.3 degree annually. Citizens of some countries cannot enter China without valid Chinese visa. Please, review the situation in your country. For short visit like conference, one should apply in the nearest Chinese Embassy/Consulate for business visa with single entry option. Procedure is usually reduced to filling visa application and presenting the official invitation letter. After that it takes usually a week to issue a visa. Another possible way is to apply a sightseeing visa to China. You may ask your travel agency to apply a sightseeing visa to China for you. In this case, you do not need the official invitation letter. A completed Visa Application Form. Forms can be obtained by fax from ACCEC Travel. Two 2" X 2" photos showing applicant's full front face. Current Passport that is valid for a minimum of six months from the date of travel. The passport must also have a more than two blank visa pages. Applicants should come in person or through a third party (e.g. Travel Agent or Tour Operator) to apply for the Chinese visa during office hours 9 -12 am in Chinese Embassy / Chinese Consulates-General in the country you live. Usually, the processing time is about 5- 7 working days. Applications by Mail: It takes 2 weeks to process the application, so there is no same day or express day service. It is advised that your passport(s) should be sent by registered post for security and proof of posting needs to be kept. Please enclose a self-addressed envelope, the visa application form and payment . There must be at least one totally blank page in the passport. Pages for endorsements or amendments cannot be used as a visa page. Single or double entry visa requires a passport valid for at least 6 months. For multiple entry visas, a passport should be valid for at least 9 Months. The photo of the accompanying person using the same passport should be affixed to the form. The full visa fee will apply. Fees for Visas can vary from one country to another but details can be obtained from the web site of the Chinese Embassy in your country. For details of Chinese Embassies in different countries, please click here. (http://www.travelchinaguide.com/embassy/embassy_list.htm). All foreigners intending to enter into, exit from or transit through Chinese Territory must have a valid visa. For further information please consult your nearest China Visa authorities. Visa validity: A single or double entry visa is normally valid for three months form the date of issue. Multi-entry visas can be valid for either six months, one year, or two to five years. Duration of stay/number of entries: Duration may vary and it is possible to extend the period of your stay when appropriate. It should be noted that entry into China from Hong Kong or Macao is subject to a special permit. The Large Wild Goose Pagoda (dayanta) is located within the premises of the Temple of Great Maternal Grace (Dacien Si). This magnificent pagoda is four kilometers south of Xi'an and many regard it as a symbol of the city. 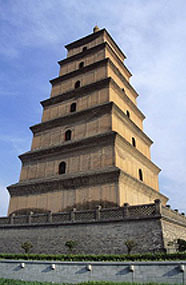 The pagoda, built in 652 A.D, is a square pyramid and stands at 60 meters high and seven storeys tall. Legend has it that the Temple was built by Emperor Tang Gaozong to honor his mother, Empress Wende. The Temple is also said to have been built to house and protect Buddhist scriptures collected in India by the Chinese monk, Xuan Zang. 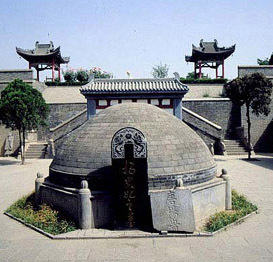 The Tomb of Concubine Yang is situated about 60 km to the west of Xi'an. This is the penultimate stop on the Green Bus tour from the city. 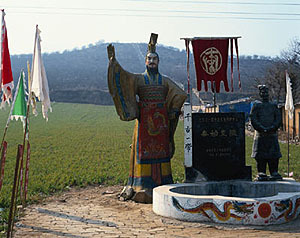 Yang Guefei's tomb is situated near to Xi'anyang city which was the capital of China's first dynasty. Although many of the tombs and the Famen Temple are a long way out of Xi'an, it is worth visiting these places if you have time. It takes a long day to see all the sights along this route and it's best to just pick a few of the more interesting tombs and temples along the route and make the effort to see them properly. 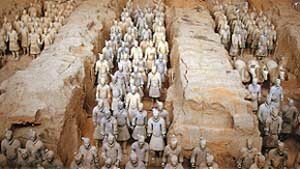 Arguably one of China's most famous and popular tourist sites, the Terracotta Warriors (bingmayong) are among the top archaeological excavations of the 20th Century. The warriors have made Xi'an the biggest tourist destination today and the wealth in this city owes much to their discovery. This incredible collection of 6,000 men and their horses was actually discovered completely by accident by a group of peasants in 1974 who were digging a well! In a bizarre twist, the man who supposedly discovered them now sits in a hall at the site signing postcards of the stone army. At a height of 2,160 meters above sea level and about 120km/3hours east of Xi'an, Huashan, literally translated as Flower Mountain, is a sight for sore eyes. 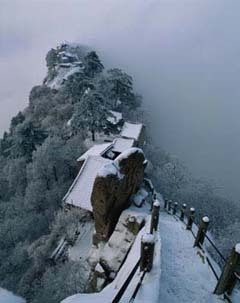 The mountain has for centuries been deemed as one of China's five sacred mountains (Wu ye), along with one Hengshan to the northeast, Songshan and Taishan to the east and another Hengshan to the southeast. Huashan, also known as the Western Mountain (Xi yue) due to its geographical location in relation to the others, is famed as the most precipitous of the five. Along the 12km path leading from the foot of the mountain, where it starts at the Jade Fountain Temple (Yuchuan si), to its five peaks, you will get the chance to see some impressive scenes, including the strangely shaped granite peaks and the twisted pines, that make up this, one of the lesser visited of the holy mountains. Located at the foot of the Mountain Li and 2 km west of the Terracotta Army, is the tomb of the Qin Emperor that the warriors were built to protect. This is a very tourist oriented site and it leaves many people feeling cold. Today, it is hard to imagine the incredible glamour and grandeur that must have surrounded this tomb in 221 BC. The Famen Temple is located in Famen Town 120 kilometers west of Xi'an. It is a famous temple in China. It was built in ancient times to house the bones of the fingers of Sakyamuni, the founder of Buddhism. Famen means the initial approach to become a Buddhist believer. The Famen Temple was constructed in the Eastern Han Dynasty because of the stupa there. 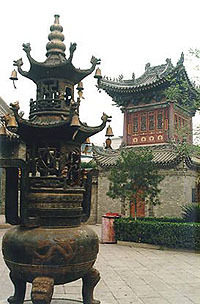 The Famen Temple stupa also known as "the Real Spirit Pagoda", is famous for the fact that it houses a finger bone of Sakyamuni, and the Famen Temple and its stupa enjoyed the reputation of being the "forefather of pagodas and temples in Central Shaanxi". 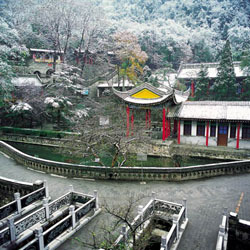 Huaqing Hot Spring (huaqing chi)is situated 30 kilometers east of Xi'an at the foot of the Lishan Hills. The Springs were a popular retreat with Emperors more than 2500 years ago, many of whom enjoyed bathing in the perfectly clear mineral water. Today this is a favorite site for Chinese tourists. In fact, there is not a great deal to actually see here, but the history behind the area is very vivid and colorful!